This race, Boston qualifier or no Boston qualifier, is inextricably linked with a host of emotional and personal issues, so...well, bear with me. I knew months ago that no matter what the results, this race would be a resolution of sorts. Writing about it in absurd amounts of detail is simply my way of decompressing from a training cycle frought with fear, excitement, numbness, triumph, and confusion. If you just want to know how I did in the race, results and splits are to be found at the bottom. But to me, it will always be an ending to the story begun late last year. Long story short, less than two weeks after this training cycle began in December, I was attacked and sexually assaulted while on a training run. I posted about it at the time, as I'm sure many of you remember, and the support and encouragement I received was a priceless gift at a difficult time. Thank you all, once again! It felt imperative to me to talk to fellow runners about it, especially women, who, like me, run a lot of miles alone. But I still haven't been able to bring myself to talk about it with many people in my life. Anyway. I was not physically harmed beyond a few minor scratches, so I ran the very next day on the treadmill. It felt good to move and to sweat. I immediately felt better. I think it helped me sleep that night (but the biggest help was the fact that the man who had attacked me had been arrested). And so it went. I threw myself into training, running longer miles than I had previously thought possible. If I felt like wavering, I just tapped into the anger and helplessness brought on by the attack. It's as if by not running, I allowed him to "win." He had attacked and prevented me that day from running, my antidote for life, my means of escape. I wouldn't let him stop me, and I wouldn't let him taint it. Sometimes I ran with clenched fists, trying to process the anger. For this training cycle, my second serious BQ attempt, I chose to move up from Pfitzinger's 18/55 training plan to his 18/70 training plan. I had originally planned to modify it to lessen the mileage a bit, but instead I ended up following it very closely, allowing myself extra rest days here and there. I stood up to the jump in mileage very well, I believe, because I concentrated on running much slower, in general, than I was used to. Recovery runs were in the 9:45-10:00 range, long runs 9:30-10:00 (dipping down to around 9:20 in the latter half of the cycle), general aerobic around 9:15-9:30, and tempos around 7:40-7:50. I stopped thinking about paces and concentrated on how I was feeling. On a recovery run, I didn't want to hear myself breathing. If I needed extra oxygen, I was probably running too fast and not truly recovering. My total mileage was 1043.29 miles from December 8 to April 10, for an overall average of 58.28. I peaked at just more than 70 miles, and my cutback weeks (sometimes with an extra day off) hovered a little below 50 miles. I also ran three tune-up races. The first was a 10-miler, in which I PRed by about five minutes with a 1:14:52 (7:30 pace). I knew I was on to something. The second was a half marathon. Another near-five-minute PR, 1:40:24 (7:40 pace). 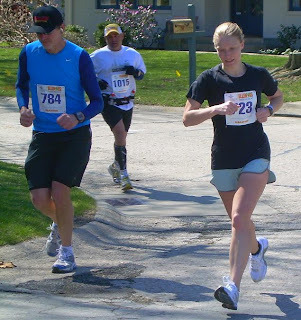 The third was three weeks out from race day, a 10K in 44:11 (7:07 pace), a 97-second PR--over a time from high school, almost ten years ago, on a downhill course. These told me that I was still seeing above-average fall-off in pace as the distance increased, but that this problem was improving with my higher mileage. And could the slower overall pace have something to do with it too? Most of all, they told me that I could probably expect somewhat less difference between my half marathon and marathon paces. Before it was 48 seconds. Now, I needed it to be 46 seconds or less in order to squeak in for the BQ. 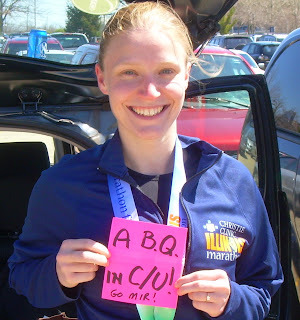 A note on my previous BQ attempt(s). I ran Sunburst 2008 as a bid to finally break 4 hours for the marathon; it was not an "official" BQ attempt. I went out shooting for 3:45-3:50. However, because of a snafu with the mile markers, I found myself on BQ pace at halfway and feeling amazing. The stars just aligned for that race. But the one responsible for my foot missed the boat. It suddenly started hurting at mile 17. I'll never know if I could have finished in 3:40, but I think I would have been close. My foot was like a ball and chain holding me back, but the rest of me continued to feel amazing until at least mile 23...and even with the foot, I held on pretty well for a 3:50 finish. Then I ran my first legitimate attempt last fall at Monumental 2008. I didn't get in the training that I wanted and I was overambitious, causing me to go out for the 3:35 I thought I was in shape for. I crashed at mile 20 and struggled in at 3:57. I would not be making that mistake again! During the week of the race, I drank a lot of water, ate a lot of carbs, and got a lot of sleep. Although I thought about setting a more ambitious goal based on my training cycle and tune-up races, I decided in the end that 3:40:59 had to my sole objective. There would be no A, B, or C goal here. It was all or nothing. On race morning, I woke eight minutes before the two alarms I had set for 5 a.m. I had been suffering from back pain all the day before, and as I got up and tried to move around, I discovered that it was worse than ever. I could walk or run forward with no problem, but twisting around hurt like hell. I suppose I should be thankful I wasn't playing a big tennis tournament or something that day! It also hurt to hunch over, and I was worried that my back would cramp up late in the race. But I had no control over that (other than staying well hydrated, which I did). So I went about my race morning preparations. I took a shower, which helped ease the back pain somewhat. Then I met my friend and fellow blogger Joe down in the hotel lobby to hand off his race bag (he drove in that morning and had asked me to pick it up for him the night before). He had made me a small sign that read, "A BQ in C-U! Go Mir!" I was very touched, and it also gave me a thrill of motivation. I told myself, "I will make this come true." Finally all was ready and we left the hotel at about 7 a.m. We parked near the start line and immediately began searching for the bathrooms. First we tried the stadium. Huge lines out the doors. Ugh. I heard someone say they had 40 portajohns near the start. Excellent. Maybe not so many people there since it was still 30 minutes until race time and it was pretty cold to just stand around (38 degrees, slight wind). We made our way down to the start. Oh, okay, so about a billion people. Oops. Still, with that many portajohns the wait wouldn't be so bad. Then I realized that the start corral was lined with portajohns--that faced inward. People were squeezing through masses of people waiting for the bathroom, looking for their pace groups. Other people, like me, were about to wet their pants by this time and simply wanted to find the end of the damn line. It was an utter clusterf*. Finally I found the end of a line and got in. Spontaneous urination was imminent. A wonderful person named Lindsay actually let me cut in front of her because she didn't have to go as badly. She was going for between 1:30 and 1:40 in the half. I hope you did great, Lindsay! Once I got out of the bathroom there was nowhere to go but back into the crowd. I found myself near the 3:30 pace group. I simply didn't have the energy to fight my way back to the 3:40 pace group. I didn't plan on using the pace group, but I figured on hanging nearby for at least a few miles to help me get into a groove. Well, whatever. Allowing 3:40 to catch up would help me have a relaxed first mile. I would just have to stay to one side and try not to get in anyone's way. I had a few minutes to mentally prepare. I felt relaxed and ready. The weather was perfect, it wasn't too windy, and I was tentatively confident of a good day. I crossed the line about a minute after the gun. I tried to stay as calm and relaxed as I could. I was a little shocked to see the first mile marker already. 8:01! Holy crap. Okay, Mir, just dial it back a notch. That is much too fast. I was actually a little pleased. If 8 minute pace felt that relaxed, then 8:20s were going to feel like a jog. Then the next mile was 9:07. Don't dial it back THAT much! Eeeek! Still, now I had the 3:40 group about 50 feet in front of me. Well, good, I thought. Still, I felt like I had to speed up just a bit, and it did not feel like a jog. I stripped off my throwaway hat, then my throwaway long-sleeve T-shirt. I hit mile 3 in 8:28. Better, but on the high side of my goal range. Still, I relaxed again. Mile 4 came in 8:14. Oh, eek. What is up with this pace group? In mile 5 I threw down the gauntlet (gloves. HA.) and moved past the pace group. Mile 5 in 8:17. Here we go! I never saw the pace group again. I had been trying for the past couple of miles to assess exactly how I was feeling and how I was reacting to this pace. The signals coming back were not overwhelmingly positive. At Sunburst last year, I felt perfect just cruising along, and the miles flying by. At Monumental, the miles flew by, but I knew I was using up energy too quickly. Here, I was somewhere in the middle. Although my mile times were better, at no time did I feel like I hit a real groove. The miles didn't click off like clockwork; I was very aware of each one. I did feel relaxed and very good, but I realized I was going to have to stay very focused to maintain my pace. I felt as early as mile 3 that the BQ was not necessarily in the bag, and that I might find myself in a real struggle at the end. I concentrated on getting to 10 miles, then the half, then 17 miles. Mile 17 is sort of like my own personal wall. That's where things always seem to fall to pieces, one way or another. At Sunburst, still feeling like a million bucks, that's where my foot suddenly started hurting. At Monumental, that's where I realized for sure that yes, the pace was too fast, and I started falling off. I hit 17 still feeling good. Not exactly Sunday-jog-in-the-park good, but the same relaxed-but-focused good that I had settled into. Legs were still feeling decent. I started to pick off some carnage from the 3:30 pace group. Passing people caused me to subtly push the pace, although I was a little shocked to run mile 18 in 8:04. Ooh. Probably not a good idea; you still have a ways to go. Although I still felt good, I didn't think it was going to last. Mile 19 was back to 8:24. All right. Just keep it here. That's all you need to do. Still, I could feel fatigue creeping in. I began to work. Legs still feeling okay, but heavy. I don't have a heart rate monitor, but I guessed that my heartrate was up. I could hear myself breathing. As I counted the miles down, I hung on doggedly to the pace. Mile 21, 8:21. Awesome. But five more miles seemed like a long way. Mile 22 in 8:27. Really starting to feel it. I tried to reason with myself. What exactly is the pain you are feeling? Your brain is trying to trick you into slowing down. I was feeling it in my legs, but I didn't have the quad-busting pain that I had had in the past. You know, the kind where you keep looking down to make sure your legs aren't mangled stumps of bloody meat? The mileage had prepared my legs well. It wasn't that. I was just running low on fuel and my body was ready to quit. Mile 23 crawled by in 8:34. Argh. I had another argument with myself. You can't give up now. Hang on for three more miles and you have it. But another part of me sized up the fact that now I was getting really tired. Would the race or my body give out first? I eked out mile 24 in 8:28. Only two left! Come on, this will be such a crappy story if you don't BQ! This is where I started trying (and failing) to do the math. I realized, peering at my pace band, that I had banked some time. I couldn't figure out exactly how much, perhaps a minute or so. How much could I afford to slow down? I had no idea, so I kept throwing each leg forward, one after the other. "Don't stop, don't stop, don't stop," I kept telling myself. Mile 25 was 8:38. Oh crap. I realized that my legs were dead, and it was entirely possible that my conservative race plan had not left me enough time to make up for late-race fading. Had I cut it too close? My fiance found me late in mile 26. By this time I was just ready to be done. I couldn't manage complete sentence, only curses. Mark ran with me for a couple of tenths, maybe a quarter mile, and told me I was getting close. "It's just around this corner, and then you're in the stadium," he said. "You're almost there." Mark has finished a marathon and knows better than to say "You're almost there" unless you ARE almost there. I growled, "Too many corners," spat curse words with every exhilation, and struggled gamely on. But I could sense the end was near. Mark peeled off and I picked up a bit more speed. Mile 26 in 8:40. Descend into stadium, every step a jolt. Flail out onto football field. Motor control gone. I looked down and saw 3:39 something on my watch. I had to run all the way up the field, make a wide U-turn, then run halfway back down. I put my head down and gave it everything I had left, miraculously not colliding with anyone. I looked up and saw the race clock ticking inexorably to 3:41, but knew I had a minute beyond that. I threw myself across the finish line right at 3:41 gun time, 3:40:07 net time. First half: 1:50:12; second half: 1:49:55. I am notoriously bad about prerace fueling. I've always had trouble forcing myself to eat early in the morning. I managed to get down some Carnation Instant Breakfast and a GU. Obviously something to work on. I also took GUs after each hour of racing. Besides that, I alternated water and Gatorade at all but two or three water stops (always drinking water with the GU). I sipped water throughout the morning before the race, until one hour before the start. After my prerace bathroom adventure, I never needed to go during the race. This was an inaugural race, and I would say that, other than the clusterf* that was the start/bathroom lines, the organizers did a great job. Crowd support was good, and people seemed genuinely excited to have a race coming through their neighborhoods. The number of water stops was adequate. Some of them gave out full bottles of water, though, which was very wasteful. I hope the later runners didn't suffer because of this. I couldn't have asked for better weather; 38 at the start and 49 at the finish. The day was sunny, but with the cooler temps it didn't become a factor for me. Headwind noticeable at times but not bothersome. No hills to speak of. Upon more thought, I actually don't feel that I peaked very well for this race. But my training got me through. Mission accomplished! YOU DID IT! Congratulations girl. Truly an inspirational tale of what you've had to overcome. It was a great race (negative splits - woo hoo!) with near flawless splits. I'm so happy for you and so happy you were able to punch that ticket to Boston. Big Congrats! No joke, I am crying. I am so proud of you. You f-ing nailed it. I worship you!! Congratulations. Congrats, you're going to BOSTON!! I didn't scroll down until the end because I wanted the suspense, but you had me SO worried when the clock said 3:39...I was like, "Noooo she HAS to make it!!" And you did!! You totally deserve it! Mir, this is so wonderful!! I'm so happy for you!! What a treat to see you that morning and give you a small boost with that silly little sign! Glad it made a photo op!! This means so much more than a mere race... I'm so very happy for you!! I am very happy for you Mir. Congratulations once again. Great job. You definitely deserved this outcome. Have a great time in Boston! Great run, great report Miranda. Already looking forward to how you get on in Boston '10! Oh man, I teared up on that one. You did awesome. The eating thing is a serious pain. I need at least 400 calories for breakfast to be happy during the race. Poptarts, powerbar, gatorade. Seems to do it. Gu roughly every hour (miles 7, 14 & 21). Get really screwed up with breakfast at Boston because the race is at 10 but you have to be on the bus at 7. Anyway I am SUPER impressed! I hope we can get together sometime soon. congratulations Miranda, you did it, what a great race repor. I'm in such awe of you, oustanding just outstanding, you're going to Boston. You're an inspiration and I hope I can use your energy to get me to Boston soon too. Miranda, I've been meaning to read the report, it's great by the way. Congrats on the BQ, its much deserved with all the training. Next years Boston will be pretty memorable for you. Enjoy it! How was the inaugural marathon by the way? Did the Bana' represent? Congratulations! A BQ....AWESOME! I've been following you for some time through your efforts and I know you really wanted this bad. And knew it was only a matter of time. That time is now. Congratulations again! See you in Boston in 2010? WTG Mir! You did it! I'm thrilled for you...you triumphed over a LOT during the past few months and should be very proud of yourself. Can't wait for the big party in Beantown next year! Great Work... I loved reading it more cause I was there. Stumbled upon it, thx for the reminisce. My last miles went very much like yours. Did you stay with the pace group the whole time? I'm not convinced Dave actually brought them in on time. John--'Bana did great! Lots of volunteers, and people out cheering in their neighborhoods. They did some research too...I remember one sign that said "You are 59.5% done!" And lots of them were not near a mile marker but had figured out about where they were and were telling us. It did not seem like a first-year event. Too bad it's so close to Boston--you'll have to run it some year! Jessica--I actually talked to another girl who ran with the group until mile 21. She thinks he came in just under the wire (I guess "the wire" being 3:41 net time). I hope so. I was wondering too. I passed them at mile 5 and never saw them again, but I could hear people cheering for them not far behind until the low 20s. I don't think it was me you heard...I didn't say anything about mile 17, although I was thinking it very loudly! LOL. You give meaning to the term "survivor." Thank you for sharing your story of overcoming obstacles. You are an inspiration to all runners! Looks like you're Boston bound in 2010!!! !